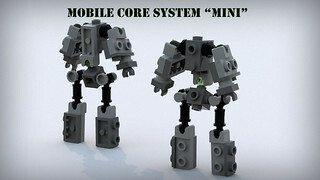 Although popular with its target audience, the Mobile Core System is not without its critics, most of whom point to the larger than standard stature as a glaring problem, particularly those operating in high gravity environments. Phayze Fructification, inc. had a long history of heeding critical advice, and so an offshoot project was started to meet those needs. The MCS-m retains numerous technological innovations pioneered for use by its "big brother", but boasts a significantly more compact form factor. By necessity it mounts a much smaller reactor, though it has been tuned to its limits to achieve benchmark standards the PFi's MCS Project Leader can be proud of. This chopped-down version of the narrow MCS variation measures it at just barely taller than a Chub (after a head is added, of course). Naturally, I had to sacrifice a lot of the articulation that I do so love, but I'm pretty pleased with the results anyway. I have a bad habit of using clip tiles for hands, which rely on highly articulated elbows for posing - since this guy lacks elbows of any kind, I had to get weird with it... we'll see how many arm variants I end up with as time goes on.